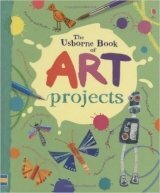 This miniature edition of 'Art Projects' is packed full of inspiring creations which use a variety of materials to create exciting drawings, paintings, prints and collages. Aspiring artists can follow the simple step-by-step instructions exactly, or use the ideas to create pictures of their own. It includes lots of ideas for framing pictures and making cards.